New York restaurants are busy places. Employees are focused on customer satisfaction and they are busy providing superb food and the best customer service available. It is no secret that high quality and clean restaurant will bring in a lot of business but when employees are busy there is not much time to focus on deep cleaning. This is where restaurant cleaning services come in. Restaurant cleaning professionals will take care of hard work of keeping the restaurant in pristine condition which will increase employee productivity by allowing them to maintain their focus on keeping customers happy. A clean restaurant is a happy restaurant. What Does A Restaurant Cleaning Service Do? Cleaning services NY will clean exhaust fans on a regular basis. Exhaust fans become clogged and create fire hazards if they are not maintained properly. With a cleaning service, New York City restaurants will be in tip-top shape because not only will they clean exhaust fans but they will pressure wash floors as well as the restaurant exterior. They will mop and wax floors, empty grease traps, and sanitize bathrooms on a regular restaurant cleaning schedule. Cleaning companies in NYC will clean filters, wash range hoods, maintain carpets by vacuuming and keeping them clean and stain free, clean both exterior and interior windows, and provide special cleaning services NY when needed. These are only a few of the tasks done by a New York City cleaning service and prior to hiring New York cleaning services, business owners should research and compare services and prices. Cleaning companies in NYC will do much more than the basics of keeping a restaurant clean. Hiring New York cleaning services will help business owners not only achieve but maintain the high health code which New York is known for. A New York City cleaning service will also help restaurants be prepared for insurance and fire inspections which are required by the state. Restaurant cleaning is a lot of detail work. It can be time-consuming and when business is booming, it is difficult for employees to pay attention to tedious tasks such as carpet cleaning, washing windows, pressure washing the exterior, cleaning exhaust fans, and grease traps. A restaurant cleaning service will take care of these things by following a regular restaurant cleaning schedule based on the needs of the business. 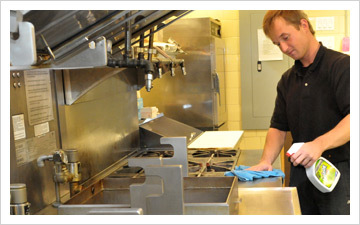 A restaurant cleaning service saves time and money for business owners. How is this possible? By hiring professionals who have their own equipment and are trained in how to use products and equipment properly, business owners do not have to take time to train employees in care and maintenance. They also do not have to purchase and maintain this equipment which saves them money in the long run. Professionals following a restaurant cleaning schedule take these tasks so employees do not have to. This in turn allows employees to focus on the most important aspect of a restaurant business; the customers. Where Else Are New York Cleaning Services Used? New York cleaning services provide their services for more than restaurant cleaning. With a cleaning service, New York City will have cleaner homes, apartments, offices, and commercial properties. Cleaning companies in NYC provide service to various places and no job is too large or too small. With cleaning services, NY businesses, schools, and daycare’s will be kept neat, clean, and hygienic. A New York City cleaning service knows the high standards of the local businesses and will provide a quality service that exceeds those expectations. With a professional cleaning service, New York City will remain the place that locals and tourists love, admire, and respect so much. With a New York City cleaning service no corner will be missed. The staff is professionally trained in everything including the simple tasks. Carpets will be vacuumed, floors will be mopped, and windows will be cleaned. Restaurant fixture will sparkle and the entire place will be dust free. Most professional cleaning services will also provides specialty services that have been requested and for a slightly extra cost. Cleaning services use machines that can remove grout stains and other hard to remove stains. Services may also include a deluxe version of window washing which will provide the clearest view of the fabulous skyline New York has to offer. New York is a place that is loved and admired by many. Keeping it clean and beautiful is something professional cleaning services take pride in. Before hiring a professional cleaning service, be sure to do plenty of research on the companies available. Compare services and prices to be sure your business continues to meet the high standards you value. The following links will provide more tips and advice on keeping your business a clean and safe environment.